Ben Sandiford is already known throughout the international Wildwater circuit as a fervent supporter of athletes. He has served as one of the International Canoe Federation's chief judges at Wildwater World Championship events throughout the years, and has always been available to drive shuttles for senior athletes during training runs. It is becoming clear he is just as passionate about junior athlete development. U.S. Junior athletes like Joe Barkley, shown here at the 2001 Bala Worlds, would benefit from retired athletes' experience. Sandiford is actively picking up the torch from John Handyside and the British Canoe Union's efforts to host a Masters-level race in conjunction with the 2002 Junior World Championships. 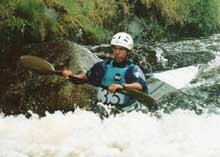 He is recruiting retired Wildwater athletes to accompany juniors to Bala, Wales. "On one level, the race is designed to get the 35-plus-year Wildwater racers back to the International circuit--to catch up with old friends and adversaries and also test their post-retirement mettle on a world-class race course," said Sandiford. But he stresses that the obvious side benefit, especially for poorly funded Wildwater programs like those in the U.S., is that Junior athletes will be able to train alongside some of the world's most experienced racers. While the coaching and chaperoning benefits are obvious, he emphasizes the osmotic absorption of discreet technique and competitive verve when in the presense of accomplished senior athletes. "These kids are like sponges," said Sandiford. " It is hard to explain how they get faster to lay paddlers, but they make quantum leaps in speed when they train with seniors. They are already fearless, but they do so much better when they put power and skill behind their daring." Handyside, the event organizer, has included this race with hopes to create an annual event that proves to be popular and promotes Wildwater paddle sport for athletes aged thirty-five and up. The International Masters Race will be comprised of four classes with two age categories (over thirty-five years and over fifty years) in K-1 men, K-1 women, C-1, and C-2. "So far the interest has been good. It has the makings of an exciting event, especially if I can persuade athletets such as Jean-Pierre Burny (BEL), Yves Masson (FRA) and other International greats to take part," said Handyside. "There will be updates on the website, www.juniorworlds.info, to let senior racers the world over know who else is coming." "United Kingdom athletes committed to participate are Chris Hawkesworth, Graham Mackereth, Graham Goldsmith, the Witter Brothers, and Court and Goodwin, just to name a few," he continued. American racers interested in getting more information on the first International Masters Wildwater competition should contact: Ben Sandiford at bsandiford97@gmail.com. Racers from outside the U.S. should contact John Handyside at john@glebefarm.freeserve.co.uk.